It all depends! What year and model is your Roadtrek? We know of three possible locations. All have their advantages and disadvantages. Dodge – Before mid-1996. Roadtrek put the Onan in a metal lined compartment under the dinette on the driver’s side in the rear. This was a great spot with easy access to the generator. 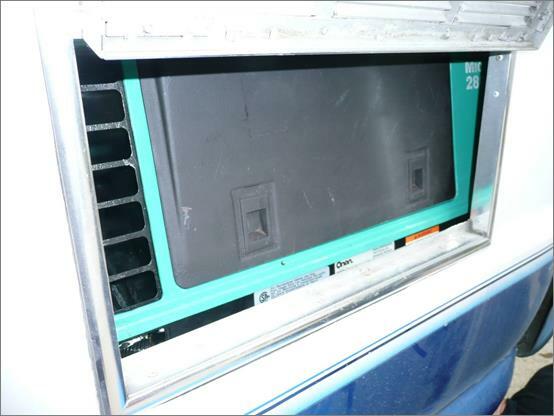 The disadvantage is that if the generator must be removed it involves several dozen screws and access to the dinette. There are a few tricks to getting the generator out of the compartment easily (it is heavy). Unfortunately the Chevys had the gas fuel fill in the generator location, so the generator compartment had to be deeper (which was why the Chevys lacked the under floor trunk). 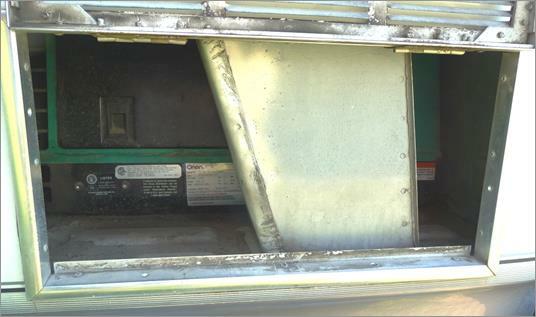 When the access door is opened the access to the generator is partly blocked by a metal box enclosing the fuel fill line. Needless to say servicing the generator around this obstruction leaves a lot to be desired. Post mid-1996 Dodges & Chevys and all Sprinters. The Onan generator is located in the center rear underneath. This exposes the Onan to the elements but Class Bs are a compromise and that means sometimes things are not in the most convenient places. 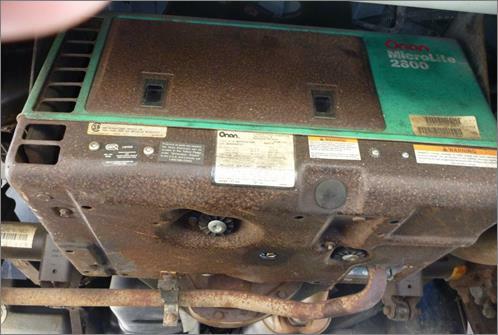 You can see why rust and bad ground connections plague Onan generators installed in the path of road salt and grime. Where the Heck is the …? 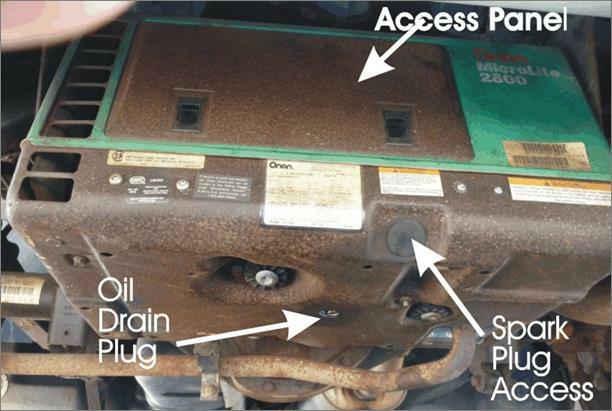 Every Roadtrek owner should be able to (as a minimum) check the oil level and reset the circuit breaker on the Onan. If you are physically unable to do this, carry some photos so you can instruct someone else on what to do. Outside View. If you have the center rear underneath installation you will see something like this when you crawl under your Roadtrek in the rear. It is from the outside you reach the spark plug and the oil drain. To open the access panel put your fingers in the latches and pull up and out. Remember the latches are at the bottom of the panel. Notes: The altitude adjustment is the main mixture adjustment. Do not run the generator for long with the access panel cover off. It affects the air flow for cooling. Carburetor Parts. Here are the carburetor parts identified. 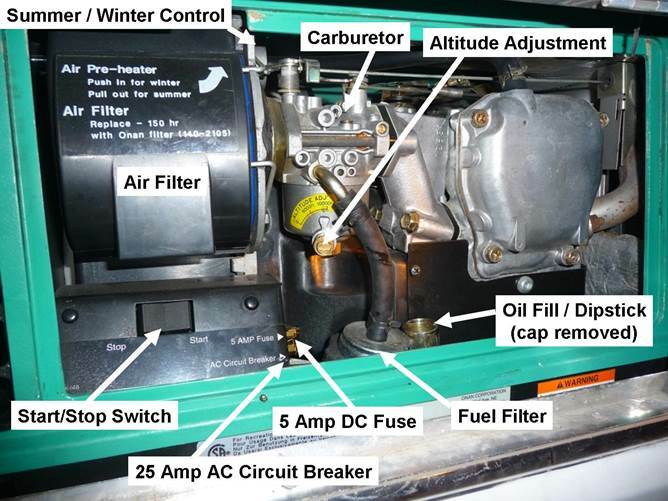 Notes: The idle mixture adjustment is hidden under a cap. It is not supposed to be touched. It is clogged idle jets from lack of use that probably create the most problems with Onans. The Onan manual says to run the generator for two hours every month under ½ load (the air conditioner or a small electric heater will create such a load). Roadtrek says one hour a month. An Onan Rep told an audience of Roadtrek owners that 20 minutes was enough IF you ran it at ½ load, since that was really all it took to bring everything up to operating temperature and dry out any moisture. HELP! My Onan Doesn’t Work! Reset the Onan Circuit Breaker?